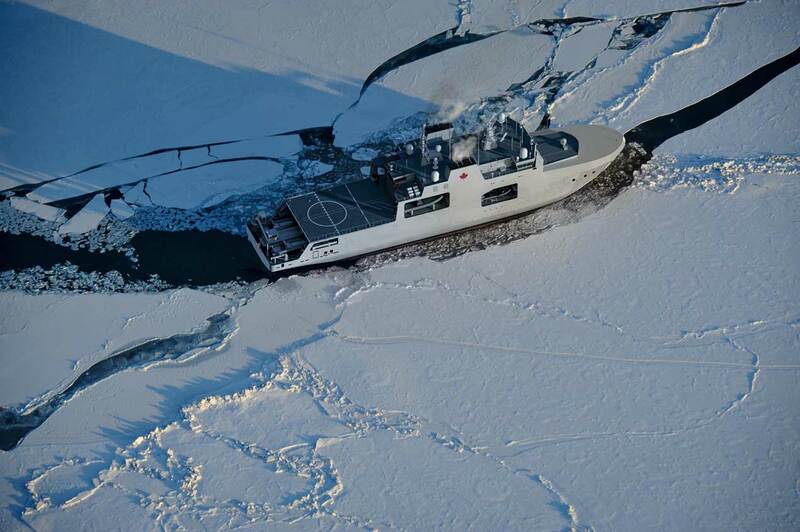 Thales awarded €3.5 billion contract to support Canada's Arctic Patrol Vessels. Canada's government has awarded the largest in-service support contract in the Royal Canadian Navy’s history, worth a total of $5.2 billion CAD (€3.5 billion). The contract, which was awarded to Thales In-Service Support, is for the refit, repair, maintenance and training to both Arctic and Offshore Patrol Ships (AOPS) and Joint Support Ships (JSS). It includes an initial service period of eight years for up to $800 million CAD (€540 million), with an option to extend services for up to 35 years. The in-service support of AOPS and JSS has been combined in what the Canadian government describes as a "modern and innovative contract," called AJISS, which it says will ensure greater cost savings for the public dollar. The contract has options to include services for the expected life of the vessels—expected to be 35 years—for an estimated total of $5.2 billion (excluding taxes). The servicing will begin with the delivery of the first Arctic and Offshore Patrol Vessel in 2018, and in 2021 for the first Joint Support Ship. Thales is no stranger to the Royal Canadian Navy, having provided in-service support (ISS) to every major Royal Canadian Navy (RCN) platform for the past 50 years, including ISS for systems on board Victoria-class submarines, Kingston-class maritime coastal defence vessels, Iroquois class destroyers and Halifax-class frigates. Canada's National Shipbuilding Strategy is a long-term project to renew the country's federal fleet of combat and non-combat vessels and saw the government form partnerships with two Canadian shipyards, including Irving Shipbuilding in Halifax, Nova Scotia, which is building combat vessels for the Royal Canadian Navy, including the Harry Dewolf class Artic and Offshore Patrol Ships. The first AOPS is scheduled to be delivered in late 2018. The government has budgeted $3.5 billion CAD for a total of five vessels, with incentives to deliver one more vessel. Construction of the first vessel is well underway, and in August 2016, the shipyard cut steel on the second vessel. Co-operating with other partners in the Canadian Armed Forces and other government departments to assert and enforce Canadian sovereignty, when and where necessary. Thales will leverage its Canadian expertise in project management, systems engineering and integrated logistics support to lead the development of a new Canadian supply chain that will offer comprehensive ISS for all systems and equipment of these fleets over their operational lifetime, ensuring they are mission-ready, on time, every time, from coast to coast to coast. It will work closely with the RCN's support facilities and personnel. Over its 35-year duration, the contract will generate economic benefit of more than $250 million CAD (€170 million) in research & development for Canada, leveraging the creativity of both industry and academia and sparking innovation in areas such as predictive maintenance, life-cycle management and logistics support analysis. With more than 16 years of performance-based ISS experience with the Royal Australian Navy in a relational contracting model, Thales will also transfer knowledge of existing and innovative ISS-ready solutions from Australia to Canada. Since 1989, the Australian government, with the Royal Australian Navy and industry, have relied upon Thales to manage, maintain and upgrade its naval assets at Garden Island Naval Base in Sydney. Thales says its ship service and maintenance model has consistently exceeded material readiness requirements and exceeded operational availability targets by as much as 30%. It has provided ISS to navies in Singapore, New Zealand, the US, Saudi Arabia, the UAE, Bahrain, Papua New Guinea, and Tonga.